Make your holidays a-meow-zing with a purr-ecious wallhanging featuring your favorite felines all dressed up in their holiday finery. Pieced panel kit contains a pattern and Cat-i-tude fabrics for the top and binding, by Ann Lauer for Benartex. Backing sold separately, 1 1/2 yards needed. 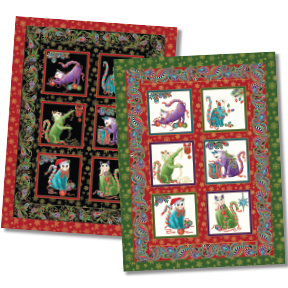 We suggest Cat-I-Tude Christmas - Mini Playful Cats Black Multi Metallic Yardage.